This motion offense uses four perimeter players and one post player, and is a good offense to use when your team has good outside players and only a few post players. Generally, we like to run the 4-out motion offense against man-to-man defenses. However, you can use the 4-out, 1-in set as a zone offense, although the rules are different (see 4-Out, 1-In Zone Offense). Many teams at all levels employ the 4-out offense. 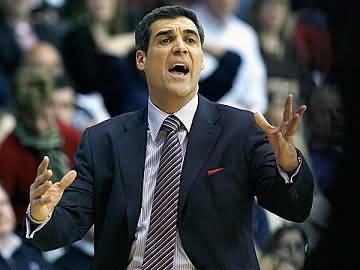 At the collegiate level, while widely used by many teams, specifically Jay Wright at Villanova has had a lot of success with it. 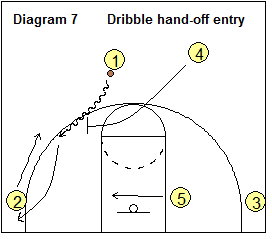 The now popular "dribble-drive motion offense" uses a 4-out set and very little screening. 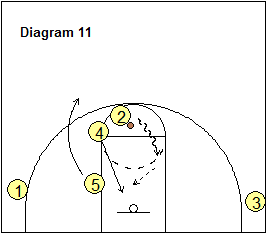 Rick Torbett's "read and react offense" works very well in a 4-out set. Below, we examine three different "looks" in our 4-out offense, depending on where we want our post player to locate... "4-Out", "4-High", and "4-Low". You can also use the 4-out offense to post up any of your players inside, if you feel there is a defensive mismatch. For example, if a defensive player has four fouls, have your player that he is guarding set up as the inside post player. Then get the ball inside to him/her and attack the defender for the easy basket (since the defender is in foul trouble and will play "soft"), or force the fifth foul. You can change the inside player by just calling something like "4-Out to John", where John is now the inside player. You can make the 4-out offense as complicated, or as simple, as you want. Youth teams should start out with just the basic 4-out motion offense, learning the motion rules and "how to play". You can add a few simple plays. High school and more advanced level teams that have more practice time, can expand and use the basic 4-out motion offense, and the "4-High" and "4-Low" sets. 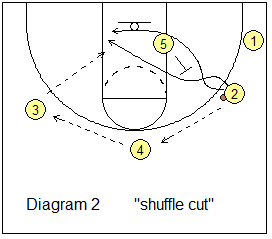 Each of these sets come with a number of set plays and options. We typically do not use all of these plays in one season. We pick those plays that best suit our current team personnel. Next season, as our players change, we may use other plays and options (or if we are blessed with several good post players, may use the 3-out, 2-in motion offense instead, and only sparingly use the 4-out offense). Use those plays that will best benefit your team. Importantly, don't overload your players and try to teach too much at once. 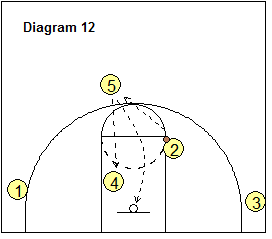 Teach the basic motion and sets, and then add other plays and options gradually. This is a more simple, free-lance style of 4-out motion offense that uses the rules explained below under "General Rules". Refer to the diagram to see the basic set-up for this offense. The 4-out offense has four perimeter players spaced out on the 3-point arc, with one post player, who can either start low or high (at the free throw line area). With "4-Out", our post player moves as the ball moves, using the low blocks, anywhere up and down the lanes, paint area, elbows and high post (free-throw line area)... basically anywhere he/she can get open for a pass inside. When the ball is on top (O1 or O2), O5 should locate at high-post, ball-side elbow area. If the ball is passed to O5 at the high post, O3 and O4 should be thinking about a back-cut to the hoop if they are being denied the pass. O5 passes to the back-cutter for the easy lay-up. When the ball is on the low wing, corner (O3 or O4), then O5 should move down to the ball-side low post. Perimeter players can fill any of the six spots shown in the diagram above, two top spots, two wing spots, and two corner spots. Outside players should be moving, screening for each other (on-ball screen and screen away). Additionally, hand-off screens work well. For example, O1 dribbles toward O2, hands the ball off to O2 while screening O2's defender. 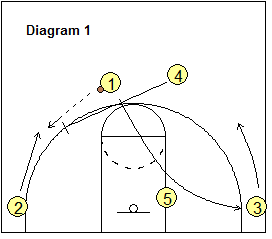 O2 comes around the screen and either shoots the three-pointer, or makes a dribble move inside (see Weave-Screen Plays). Dibble-penetration, attacking the seams, is often possible when the post player is located on the opposite (weakside) low block. If you have good three-point shooters, you can go "inside-out" where a guard dribble-penetrates a seam and then kicks the pass outside (usually to the corner) to a wide open perimeter player for the three-point shot. For this reason, we often like to locate our best shooter O2 in the right corner. Pick and roll moves work. 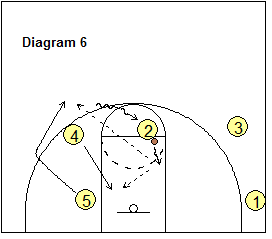 Give and go plays work (example: O2 passes to O4 and cuts to the hoop for the pass back from O4). If a dribble entry is made, the outside players rotate (example: O1 dribbles toward O2. O2 can either exchange with O1 and move to his/her spot, or O2 can rotate down to take O4’s spot and O4 cuts through to take O3’s spot, while O3 rotates out to the O1 spot). Cut to the basket (example: give and go, or back-cut). Backcut if the defender is denying the pass. V-cut and pop back outside for the return pass and outside shot. If you have an under-play (defense sagging off), pop out to spread the defense. If you have an overplay (being denied), backcut. Someone dribbling at you, backcut (except for the weave plays). Fill the open spot when a teammate cuts inside. Screen away, and pop out. The most important rule is to keep moving. 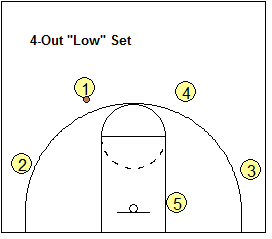 You can run any of the set plays listed below under the 4-High and 4-Low sets... just make sure you start the post player in the correct spot. Sometimes we want our post player to locate at the high post. This takes the defending post player away from the hoop and allows our post player to go 1-on-1 with defender from the free-throw line area. This also opens up the inside underneath for backcuts or dribble-penetration from the wings and corners. The high post player can also used for UCLA (high post) screens, "pinch-post" hand-offs, back-screens for perimeter players, and ball-screen pick and roll action. Our high post player can be used as a screener for our perimeter players. 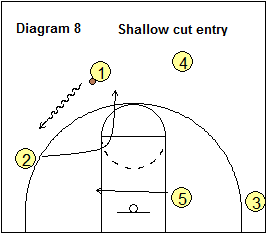 He/she may set two or three perimeter screens, and then, once a big-little mis-match occurs (by the defense switching the screens), will post up inside. 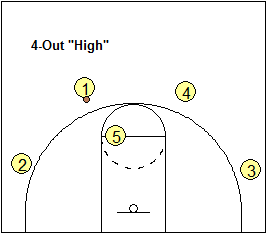 Additionally, certain plays run better off the 4-High set. 4-High may work well against teams that like to full-front our post player. Our post player moves up to the high post, and if still full-fronted, seals the defender, and cuts to the hoop for the over-the-top lob pass. Or our post player can seal the defender as the pass goes to the corner, and then cuts to the hoop for the pass from the corner. 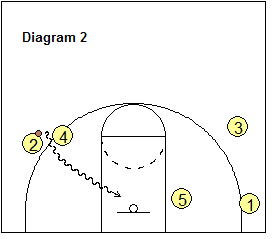 Weave-Screen Plays - "W2", W2-back", "W3", "W4"
After a rebound, the wings O2 and O3 sprint wide up the court all the way to the corners. By going deep into the corners, we open the court with better spacing. For a wing entry pass, they can then cut up to the wing for the pass. The first "big" up the court sprints low in the paint or low block area. O1 speed-dribbles up the court and our rebounder (here O4) trails up the court to fill the opposite top spot. From here we have lots of options. If our point guard is good at attacking the defender, he/she might just try to make a dribble-move and attack the seam up the right lane line for a lay-up, or for a kick-out pass to our shooter O2 in the corner. We can also just start the offense here in the "4-Low" set. To start the "4-High" set, O5 simply flashes up to the high post. We could also start here with a quick hitter play. Sometimes we like our post player staying down low, moving from low block to low block, or from short-corner to short-corner. The 4-Low set opens up the top and the lane for 1-on-1 dribble-penetration and cuts from the top. We also use this set to run our "Big" series of plays, where we post-up our "big" 1-on-1 with the defender. The short-corner to short-corner strategy is used if the defense has a big, strong inside post defender, or shot blocker, that we feel our post player cannot consistently beat in a 1-on-1 post-up situation. So if our post player can hit a couple shots from the short-corner, hopefully this will draw their big defender outside away from the hoop. Taking the shot-blocker away from the hoop then allows our smaller, quicker post player to beat the defender with a shot-fake and dribble move. Teams that play good man-to-man defense, will double-team our low post player, making it tough to score inside. Usually the double-team (help defender) comes from the opposite wing when we feed the low post from the wing or corner (diagram B below). There are a couple things you can do. 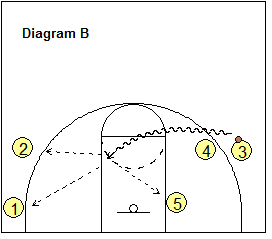 Feed the low post from the top ("hi-lo" plays like the "Big" series), because the helpside defense is not established when the ball is at the top of the key (diagram A below). After feeding the low post from the wing or corner, your post player gets double-teamed by help coming from the opposite wing (diagram B). Teach your post player to immediately skip pass out to the opposite wing (where the help defender came from), and then follow the pass and immediately re-post on the opposite side, for the quick pass back inside (from O4 in diagram C). Oftentimes, the new helpside defender (X2) will be late in rotating over to double-team, and O5 has a better chance to score 1-on-1 vs the X5 defender. In addition to the plays listed above, here are more good quick hitting actions that you can run right from the initial transition. Here's a good option when you have strong inside post player. This action is simple but effective and continuous. The rules are simple - (1) whenever O4 receives the pass on the perimeter, we look for the quick hi-lo pass into O5 posting up, and (2) if the hi-lo is not open, O4 passes to a perimeter player, follows and runs a screen and pop. Diagram A shows O1 coming up the right side in transition. O4 fills to the top, middle and gets the pass from O1. O5 immediately posts-up and O4 passes to O5 for the inside post-move. 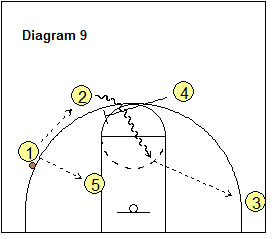 O1 down-screens for O2 and they exchange (to occupy their defenders, keeping them out of the paint so they can't help on O5). Not shown in the diagrams, after running this a couple times, the X4 defender might hard pressure O4 to help prevent the hi-lo pass. O4 could give a pass-fake, and dribble-drive around X4 up the right side of the lane for the lay-up (with pass options to O5 and O1). Diagram B shows that the hi-lo was not open. 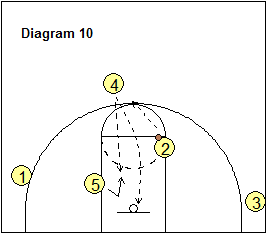 O4 passes to O3, follows the pass and ball-screens for O3. After screening, O4 pops outside. 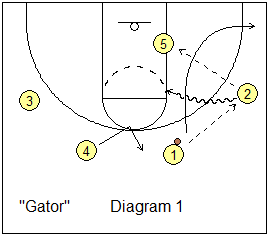 O3 can attack for a lay-up, but also has a possible dump pass to O5, and kick-out pass options to O2 and O1. In diagram C, O3's dribble was stopped. O3 might pass back to O4. Following our rules, O4 looks for the quick hi-lo pass into O5. 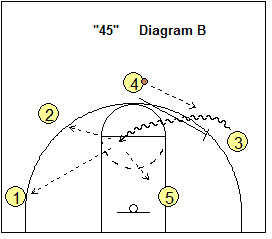 If not open, O4 passes to O2, follows the pass and ball-screens for O2, and O2 and O4 run the pick and pop. O2 cuts up to the wing and gets the entry pass from O1 (diagram 1). O1 can cut through to either corner. 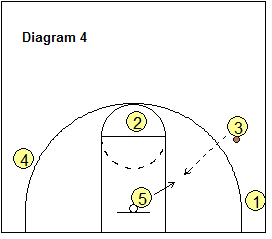 O4 then ball-screens for O2. O2 might not use the ball-screen and here drives hard to the baseline (diagram 2). Diagram 3 shows O2 using the ball-screen and the "pick and pop" option with O4 popping out to the arc after the screen. Notice O2's kick-out pass options to O3 or O1. 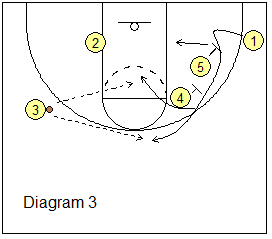 As O2 turns the corner of the ball-screen, O5 posts up hard inside and could get the quick pass from O2. If the kick-out pass goes to either O3 or O1, either could shoot the open 3-point shot, or pass inside to O5 posting up (diagram 4). Diagram 5 shows O2's dribble-penetration being stopped or trapped by the defense. Here O2 reverses and passes to O4 in the corner for an open shot, or perhaps a shot-fake and dribble-drive. O5 cleans up the back-side rebound. 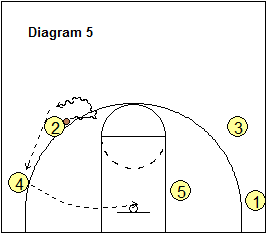 If O4 is not a good outside shooter, we will use the "pick and roll" option instead (diagram 6). 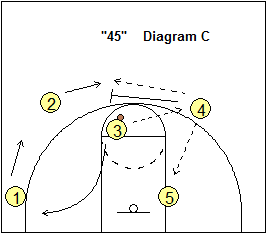 After the ball-screen, O4 cuts to the hoop and O5 cuts out and replaces O4 on the arc. This allows for spacing for the pass to the O4 on the roll cut. If O2 passes back out to O5, O5 looks to either shoot or make the hi-lo pass inside to O4 posting up. The defense may deny the pass to the wing. But we can still get the ball to the wing by using either a dribble hand-off or (2) a shallow cut. 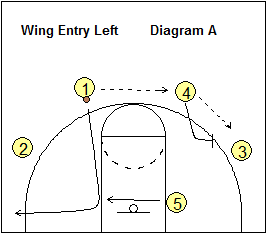 Diagram 7 shows that O1 dribbles to the wing and hands-off (weave-screen) to O2. O1 clears to the corner. From here we can run the pick and roll or pick and pop options with O4 screening for O2. Diagram 8 again shows O1 dribbling to the wing, and here O2 makes a shallow cut inside and then back outside. O1 now passes back to O2 (diagram 9) and the ball-screen options with O4 are again in play. This diagram also shows another simple option... instead of passing to O2, O1 might pass to O5 posting up. Diagram 10 shows that O2 has dribble-penetrated around the O4 ball-screen ("pick and pop"), but gets stopped inside. O2 passes back to O4 on top. 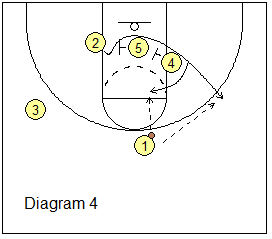 O4 can either shoot the open shot, or look for the hi-lo pass inside to O5 posting up. 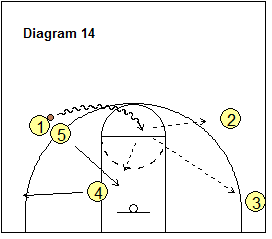 Diagram 11 shows O2 and O4 running the pick and roll option as O5 replaces O4 on top. If the pass goes back to O5, he also has the same options or shooting or passing hi-lo to O4 posting up. If neither the shot nor the hi-lo pass are good options, O5 dribbles to O1 for a dribble hand-off (diagram 13). 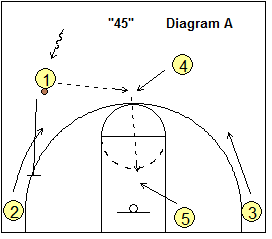 O1 and O5 can run either a pick and pop or a pick and roll (diagram 14). Similar to the wing entry above, but this time we'll run it to the left side. This time, O1 passes to O4 and cuts through to the right corner, and O5 re-locates to the right low block. Meanwhile, O4 passes to O3 and follows the pass and ball-screens for O3. 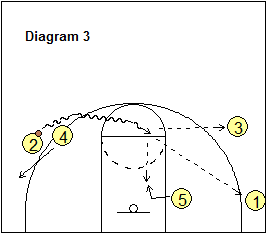 Now we have O3 and O4 running the pick and roll on the left side (diagram B). Notice the good spacing with O1, O2 and O5 all on the opposite side. Now O3 has the options of scoring, passing to O4 rolling inside, or to O5 on the opposite block, or to O2 or a 3-point shot. 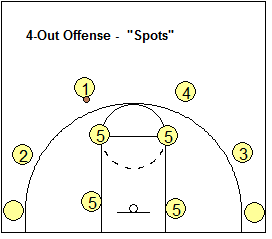 This 4-out offense play is from Findlay Prep (NV) Head Coach, Michael Peck. Coach Peck wants this action to be quick-hitting without a lot of extra passes and time consumed. Diagram 1 shows that O1 passes to O2 and cuts through to the right corner. O2 might be able to make a quick pass into O5 posting up and the play is over. 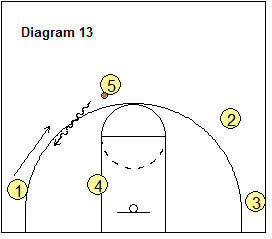 Or O2 might have a quick dribble-drive for a shot or lay-up. If nothing develops, O4 must get open (perhaps a V-cut) for the reversal pass from O2. O4 then passes to O3 (diagram 2). Meanwhile, O5 takes one step off the lane and sets a "shuffle-screen" for O2. O2 can either fake high and cut low, or fake low and cut high around the screen. 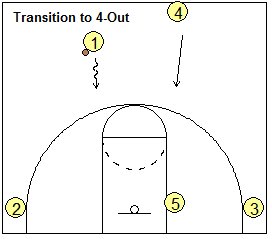 If open, O4 passes to O2 for the lay-up. Next O5 and O4 set a double staggered down-screen for O1 (diagram 3). O4's screen is just outside the elbow. O1 cuts over the screens and can either curl (if the defender is trailing), or pop to the arc (if the defender goes under the screen). If the pass goes to O1 at the top, he/she might have an open 3-point shot. Meanwhile, O5 and O4 set a double-screen for O2 (diagram 4). O5 sets up in mid-lane and O4 is just a little higher than O4. O2 either curls around the screens for a jump-shot in the lane (if the defender is trailing), or pops out to the arc for the 3-point shot (if the defender goes under the screens). Findlay Prep (NV) Head Coach, Michael Peck: "4-Out 1-In Motion Offense"